Echoes of rembetika at the Ano Syros piazza, operas in the Apollo Theatre, tsambuna bagpipes in the Apano Meria, monastery bells, boat horns, sudden gusts of wind, old grammophones, voices, memories, private narratives and formal histories. The Syros soundscape, in imagination and reality, stands on an eclectic and heterogeneous web of distinct historical and contemporary traditions, constantly under construction, reinterpretation and revision. How do sound traditions interact with the here and now of improvisation and sonic experimentation? 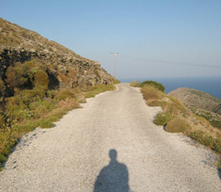 For a few days in the summer, the Syros Institute invites select musicians and artists working with sound to stay at the Old Jesuit Monastery in Ano Syros and work individually as well as in a group, in order to construct their own personal and subjective sonic narratives, documents, covers and interpretations. During their residency at the Monastery, invited artists will have the opportunity to engage with an array of individual & group activities, including visits & fieldtrips to different parts of the island, intensive group discussions, practice sessions, as well as informal impromptu gigs in homes or outdoor locations. Through these processes, participants will be able to share and exchange approaches, and to present their own, “faithful” or “heretic” reworkings and interpretations of local musical traditions, enriching them with all kinds of found sounds.